Left to right: YKHC VP of Communications Tiffany Zulkosky, Behavioral Health Administrator Ray Daw, and VP of Hospital Services Jim Sweeney. Calricaraq has been selected as one of six finalists, out of almost 90 applicants across the nation, to be recognized at the 2016 Honoring Nations Awards presented by Harvard’s Kennedy School in Cambridge, Massachuetts. Calricaraq will receive either a High Honors or an Honors award, which will be announced during the ceremony. 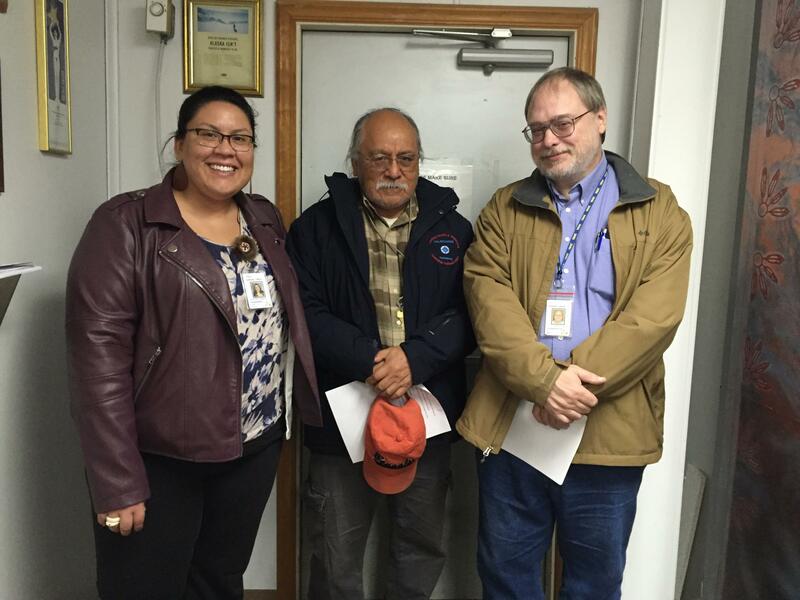 Ray Daw is the Administrator of Behavioral Health at the Yukon Kuskokwim Health Corporation. “The team is very excited to get this award. It took a lot of work for them to obtain the award,” Daw said. Daw said the team was asked by the Harvard Kennedy School to submit an application to their awards program, which they did last spring. After applying, a team from Honoring Nations was sent to observe the program at work this summer. Megan Hill is the director of Honoring Nations. 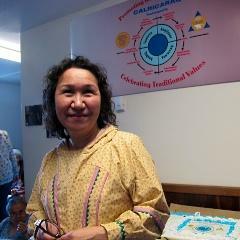 Calricaraq began four years ago, and is a program in YKHC’s Preventative Services under Behavioral Health. It focuses on cultural values that many in the region were taught all their lives. It works to heal some of the complications caused by historical trauma and colonialism by strengthening families through learning from Yup’ik elders, prescribing healthy ways of living, developing curriculums, and responding to tragic events in the region. Their activities include talking circles, healing ceremonies, traditional dancing, prayer circles, craft and tool making, storytelling, teaching values, ancestral wisdom, knowledge, and subsistence activities. All of this is done with guidance from elders. Daw said that Calricaraq started when Rose Dominick, who is now the head of the program, was exploring ways to start a culturally relevant program in their Behavioral Health department. At the time of writing, Dominick was meeting with elders about their program and how they could include cultural values in other departments, so she could not be interviewed by KYUK for this story. Hill said that the team is invited to be honored during a meeting in Phoenix. Hill said that programs selected for High Honors will receive $5,000 and those selected for Honors will get $2,000. All six programs will be featured in both Smithsonian’s National Museum of American Indians, and an online Google exhibit. The Honoring Nations Awards are a part of the Harvard Project on American Indian Economic Development. Their mission is to recognize and share the stories of programs in Native American governments that take steps for self-governance in areas like education, health care, resource management, government policy development and reform, justice, inter-governmental relations, and economic, social, and cultural programs. It was formed in 1998. Daw said that, for now, the Calricaraq team of elders, behavioral health aides, and tribal representatives will focus on strengthening families and values in our region. He said that the response has been so enthusiastic, that they are barely keeping up with demand. “We have more requests for gatherings, and meetings, and teachings, than we can manage as a unit. And I think the region has really been responsive to understanding how viable this approach is. There are always people who are asking when Rose Dominick and her team are coming to do a gathering, or coming to do a teaching, or coming to spend time with them,” Daw said. YKHC will send a team of representatives to receive the award on October 12 in Phoenix, Arizona.